Peavey T 40 - "Weapon of mass destruction"
Fender Marcus Miller Jazz Bass - "Testing it is buying it"
Washburn Scavenger - "Vintage WASHBURN SCAVENGER"
Marceau Guitars JB-S - "This is bass!" Washburn XB200 - "Excellant !! I depend on it !!" 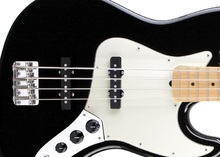 Schecter C-4 - "I really love playing this bass!" Ibanez SR300DX - "Very Nice Bass"
Line 6 Variax Bass 700 - Sunburst - "Variety of Bass Sounds"
Warmoth Jazz Bass - "A must-have if you know what you want"